Fira, formerly known as Thira, is the capital of Santorini, and was founded in the late eighteenth century and completely rebuilt after the devastating 1956 earthquake. This city offers visitors a spectacular view: a row of white houses built in the form of an amphitheatre, on top of the old harbour, overlooking the volcano. Peek in the window of any of these charming houses to discover the gap left by the caldera after the eruption in the year 1626 BC. Today, Fira is undoubtedly one of the most beautiful and unique villages of the Aegean, as well as a paradigm of Cycladic architecture. Its houses, perched some 260 metres above sea level, form a white line on the cliff edge, which gently contrasts with the dark colour of the volcanic rocks. They are small houses with multi-coloured windows and carved wooden doors, which, together with the narrow, winding alleys and blue domes, give the town endless charm. Nearly 600 steps lead up the cliff face and link the port where cruise ships disembark to the town of Fira. 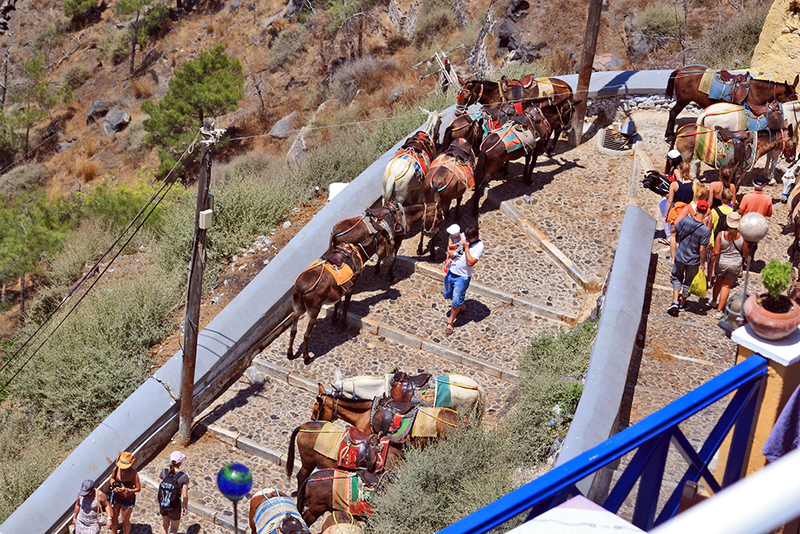 The fittest can opt to walk up, the more adventurous can choose to climb up on the back of a mule, while the rest can travel in comfort by taking the cable car. Once at the top, the adventure begins. You'll see that Fira is built along the edge of the cliff and extends along 25th Martiou Street, past Theotokopoulou Square. This square is the nerve centre of the city and is home to the bus and taxi terminal. From here, it is possible to head east, but this area holds little interest. The area to the west, however, conceals a picturesque web of old cobbled streets, terraces and stairs that carve their way through whitewashed houses. To begin, we suggest you head south and visit the Prehistoric Museum of Thira, where the history of the island, from the Neolithic to the glorious period of Akrotiri, is explained. After a few metres, you'll find the Orthodox Cathedral of Santorini, which was built in 1970 on the site of another church that was destroyed by the earthquake of 1956. A word of advice: if you want to stop along the way and enjoy breath-taking views of the caldera, go to the adjacent terrace. Further down is the old neighbourhood of Kato Fira, home to the churches of Agios Ioannis and Agios Minas. You can't miss their domes, which emerge from the midst of a maze of sun-bathed streets. You'll then find yourself in the two main streets of the Catholic neighbourhood. One is Agiou Mina, which is next to the cliff and packed with cafés and restaurants bustling with people, especially at night. The other is Ipapandis Street, which is notable for the large steps that have always formed the city's commercial centre, and Nomikou house, a beautiful example of a patrician house. A little further on is the Archaeological Museum of Santorini, which contains finds from the site of Ancient Thera and precious items found in the famous settlement of Akrotiri. Don't miss out on it. Next stop is the Ghizi Palace, an old mansion converted into a museum, known for its beautiful doors and windows enhanced with dark stone. A few metres on stands the Catholic Cathedral, one of the city's landmarks that was restored after the earthquake of 1956 and is topped by a unique bell tower that features a mixture of styles. After that, we urge you to go down the stairs leading to Nomikou Street to admire the chapel of Agios Stylianos, which sits on the cliff edge and features a striking four-colour bell tower. Retrace your steps and stop at the curve of Pastuli, just before the junction with Agiou Mina, and don't miss out on one of the most iconic views of Santorini, depicted on countless postcards. If you want to carry on exploring the island on foot and steps pose no problem for you, continue along the cliff edge towards Oia. Along the way you'll come across several towns with narrow streets that wind along the edge of the caldera and spectacular landscapes full of contrasts. If you prefer to explore the island by boat, go to the port of Fira where you can take highly recommended trips to the inner islands of Nea Kameni and Palea Kameni, and the beautiful neighbouring island of Thirassia. 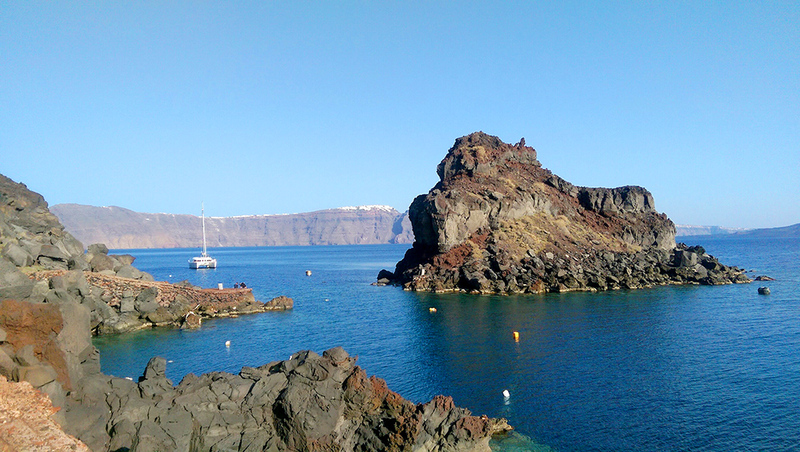 You can also explore Santorini by bus, car or motorbike rental. 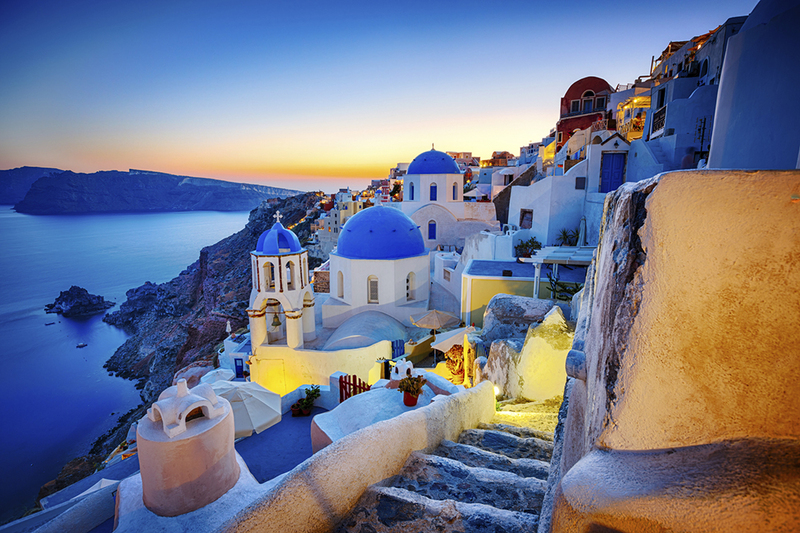 If you go for this option, it's important to point out that Fira is the largest, most popular and most accessible city of Santorini, and also forms the starting point for trips to other attractions on the island.